Initial Scientific Meeting of the COMBIOM partner’s organizations "Molecular Events in Cancer and Neurodegenerative Diseases "
Biopolym. Cell. 2012; 28( Special Issue):1-4. Biopolym. Cell. 2012; 28( Special Issue):5-7. Biopolym. Cell. 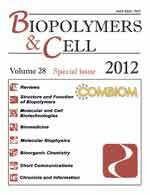 2012; 28( Special Issue):8-24.